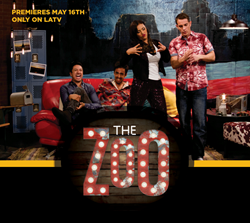 LATV Launches New #Wildtalk Show The Zoo On May 16th. We are creating unique U.S produced content that will talk directly to the millennials, as they seek a voice that they can relate and trust. The voice is here and it’s called LATV. LATV, the original national bi-cultural television network, is excited to announce a new, daily talk show called The Zoo, premiering May 16TH. It’s a fast-paced, irreverent, high-energy hour-long show featuring celebrity guests, games, trivia, and segments that cover everything from politics to pop culture, and the latest viral trends from the web. Nothing is off limits on The Zoo. The Zoo is hosted by comedian and TV personality Humberto Guida, actress and model Nelly Castillo, celebrity gossip authority Dennis Pastorizo and eccentric rebel correspondent Bruno Ulloa. LATV is known for taking an alternative approach to its programming, and now the majority of its content will be produced for all platforms in the U.S., based out of its state-of-the-art Los Angeles studios. The new programing contains a vast array of new productions that take us inside the art, the music, the sports, and the trends that Latino millennials are into today. Spearheading this initiative is The Zoo.